A big bar to fill a big need! To be more precise, Greenbelly Bars have actually 2 bars in each package that provide an entire nutritionally balanced meal! The 2 bars supply about one third of your daily nutritional needs with about 640 calories and 18g of protein and have a nice balance of crunchy, sweet, and salty. These tasty bars come in 3 flavors – Cranberry Almond, Peanut Apricot and Dark Chocolate Banana (our favorite!). They’re made with real food and no artificial preservatives. 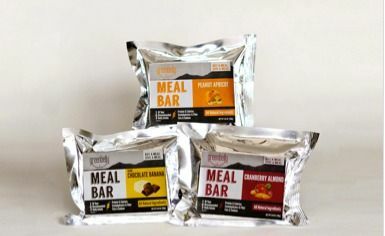 If that isn’t enough to convince you, this social responsible company has partnered with the Atlanta Community Food Bank and for every meal bar you buy, they will donate a meal to someone in need. Wow, the complete package!